One of my hot buttons is the pictures that liberal Facebook users share, thinking that words in a picture are somehow more persuasive than words alone. I’m not a fan of this form of advocacy – it takes longer to load, occupies more space, and, frankly, it’s manipulative in a way that text is not. I’m not convinced that a political posting on Facebook has ever changed anyone’s mind, ever. 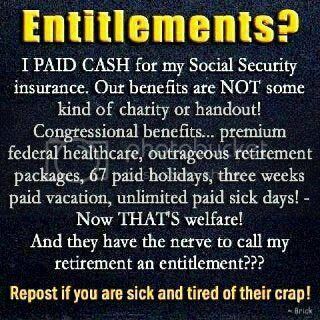 First, “entitlement” doesn’t mean the same as “charity” or “handout”; rather, it’s “A government program that guarantees and provides benefits to a particular group“. But Social Security isn’t even “guaranteed” per se – the FICA payroll taxes paid by current earners don’t get saved or stored, but rather, are disbursed to current Social Security beneficiaries. The “trust fund” is a myth, as President Obama inadvertently admitted during one of the debt-ceiling debates, when he threatened that the checks would stop. And when the payroll taxes will no longer cover the payments, and the US can’t borrow more or raise other taxes, those payments will stop. So please, spare us the plaintive cry of “I PAID CASH”, citizens. So did all the rest of us — and your elected masters Spent. Every. Single. Penny. As to the Congressional benefits, I’m totally on board with cutting those. The Founding Fathers intended that legislators be citizens first, not career politicians. This ethos was best exemplified by George Washington, who served and then left after his Presidential terms were complete, retiring to Mount Vernon. Today, we have legislators who enter Congress with humble means and become millionaires while in office – somehow, I doubt President Washington would approve. I find that a lot of my conservative friends share these in the form of Republican text images as well. Either way, it really cheapens the purpose of Facebook: interaction. It makes me want to not interact with them. In fact, I hide their posts from my feed because I wouldn’t to see any of the updates I really want to see from my friends. Facebook isn’t the forum to win hearts and minds. Let’s just be friends on the social networks.